In Golf’s Sacred Journey, the Sequel, the book that follows bestselling Golf’s Sacred Journey, professional golfer Luke Chisholm returns to his winsome and wise mentor, Johnny Crawford, for what he’s best at: advice. This time, Luke needs help of a different sort. He needs guidance on playing in the most difficult golf tournament in the world: the US Open. Victory is in sight. 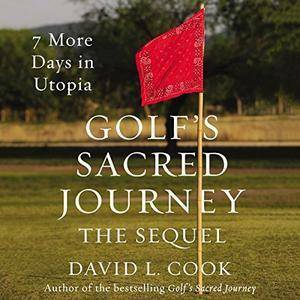 From best-selling author and performance psychologist Dr. David Cook, Golf’s Sacred Journey, the Sequel is the fascinating byproduct of counseling thousands of athletes over the decades - from PGA champions to Olympic athletes. His expertise weaves throughout this suspenseful and memorable sequel. Luke’s story unfolds from the practice course of Utopia, Texas, to the fairways of the US Open. It’s there that T. K., Luke’s rival, reenters the picture. Their rivalry comes to a head at the US Open. Their clash is epic; the payoffs and costs are great. In this memorable book, readers will acquire lessons about golf and life that they never expected as Luke and T. K. overcome gripping fears, trials, and brokenness as they pursue their God-given dreams. Golf’s Sacred Journey, the Sequel will deeply inspire listeners both on and off the green. This is a story of two golfers. This is a story of redemption. And in the end, it’s not just about a game.